I recently ordered a large wall decal from iwallstickers. I absolutely love their website! Ordering was completely seamless and quick. There was nothing confusing whatsoever about sizing and colours which is great as this is a worry for me when it comes to wall decals. Postage is free in the UK as well which is always a bonus! iwallstickers take custom orders as well so you can create your own art or choose from the designs on their site of which there are plenty of amazing ones! I ordered a really beautiful decal. 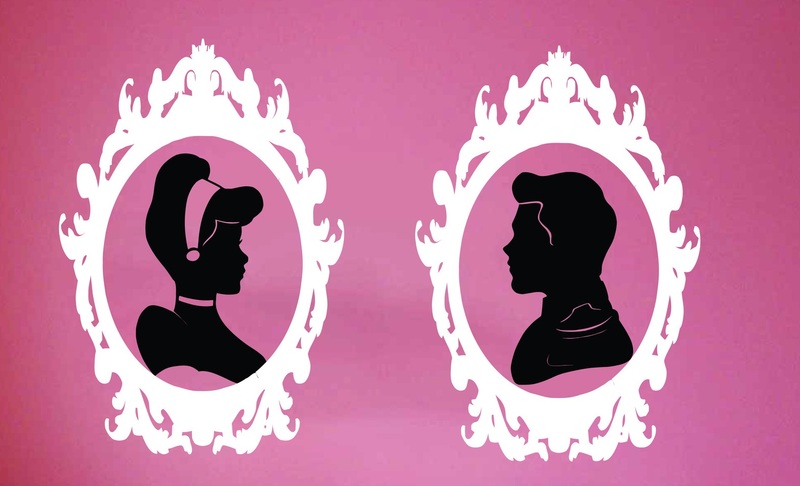 It comprises of 2 large framed silhouettes - one of Prince Charming and one of Cinderella. This is going to be installed above our bed with Prince Charming above my boyfriend's place and Cinderella above mine! This is my decal design. You are able to customise the colour of the frame though and I chose metallic silver as my wall is white. I chose the XL size as it's the most appropriate size for above my bed. I received the decal today and it was packaged in a large heavy duty cylinder with a lid on each end. It arrived safely and was packaged with guidelines on how to install the decal which is very useful. There is also videos on the iwallstickers website too which give clear instructions on how to install the decals. I shall be posting a photo of what the decal looks like when I move into my new place and put it up!